Every year, Cars.com releases the American-Made Index, which rates “vehicles built and bought in the U.S” on factors that “include the percentage of parts considered domestic under federal regulations, whether the car is assembled in the U.S., and U.S. sales.” Under these rules, obviously, it’s not just the Detroit Big 3 that’s eligible to be named one of the best American-made cars. In fact—Honda happens to boast three vehicles on the 2014 American-Made Index, a ten-car list. 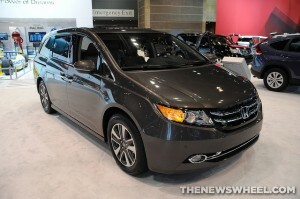 The Honda Odyssey was named one of the most American-made cars by Cars.com! The Honda Odyssey, which is built in Lincoln, Alabama, comes in at number three on the list, while the Honda Ridgeline and Crosstour slide in at numbers 8 and 9, respectively. The Ridgeline is also built in Lincoln, but the Crosstour is assembled up in East Liberty, Ohio. Honda’s strong presence in North American manufacturing has helped North American sales as well—Honda sold a total of 129,023 Honda and Acura vehicles in June 2014 alone. So, when you’re brimming with patriotism this Fourth of July weekend, remember that just because Honda’s headquarters aren’t in the States doesn’t mean it’s an un-American brand. In fact, if we dare to say it, we think you just might find that Honda is even more American than those other brands that pretend to bleed red, white, and blue. Come see us at Avery Greene Honda to buy a truly American-made vehicle today!